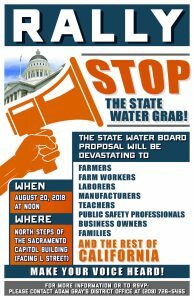 July 31, 2018 – -The Almond Alliance has filed formal comments to the SWRCB opposing the plan to demand twice as much water flows down the Tuolumne, Stanislaus and Merced rivers in a purported effort to save salmon as an attack on the California agricultural industry and threatening the economic well-being of the San Joaquin Valley. Additionally, the Alliance joined a coalition of CA Agriculture advocates to oppose the plan in a letter to the SWRCB. Click HERE to view letter.